Thank you for your consideration in giving to the St. Pete Vineyard! Your gift allows us to serve the community and our members. Your gift provides the resources needed to be an outwardly focused church and share God's love and truth here in St. Petersburg and all around the world. The easiest way to give is to click HERE! 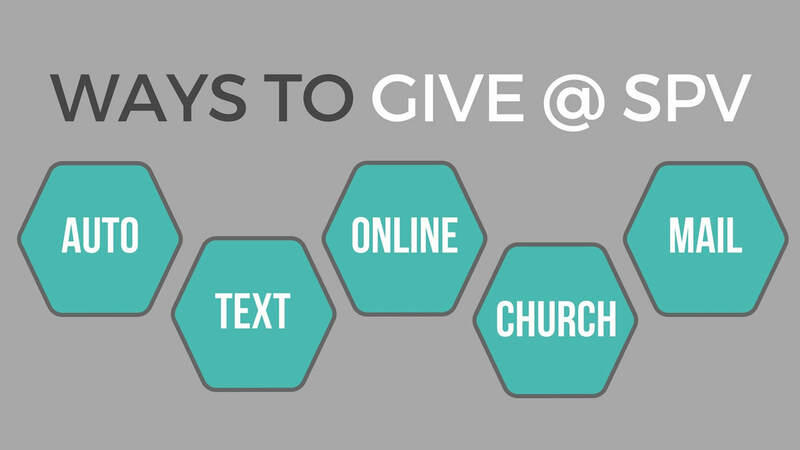 AUTOMATED/ONLINE: Giving online is a simple and secure way to give your tithes and offerings from wherever you are. You can choose to give a one-time gift or set up a recurring gift. An auto draft from your checking or savings account means you never have to worry about remembering to write your tithe and offering check, even if you are out of town. There is a form in your weekly program to fill out or you can CLICK HERE to get started. TEXT: Text giving is a fast, simple, & secure way to give, that doesn't charge your phone account, but rather uses a bank account or debit/credit card of your choice. To get started, text 727-888-2305 with "$100" (or any other amount you would like to give) in the text area, then follow the instructions on the reply text. WORSHIP SERVICE: Make giving part of your Sunday morning worship experience by bringing a check or cash and placing it in the offering basket when it is passed. Please make checks payable to "St. Pete Vineyard."